The first thing to note when you step aboard the Privilege 39 is the massive T shaped cockpit space. 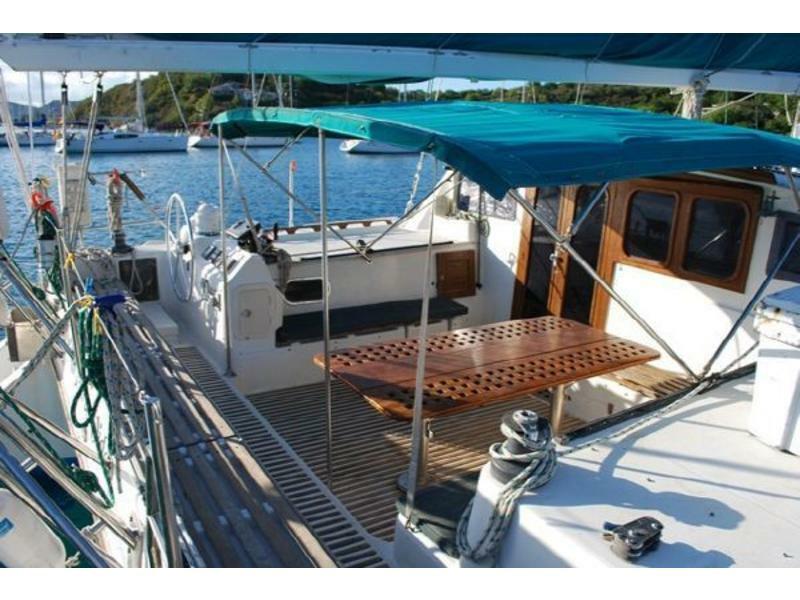 There is a big dropleaf teak table that will easily seat 8 to starboard, with additional seating to port and a bench seat aft that spans the width of the boat. 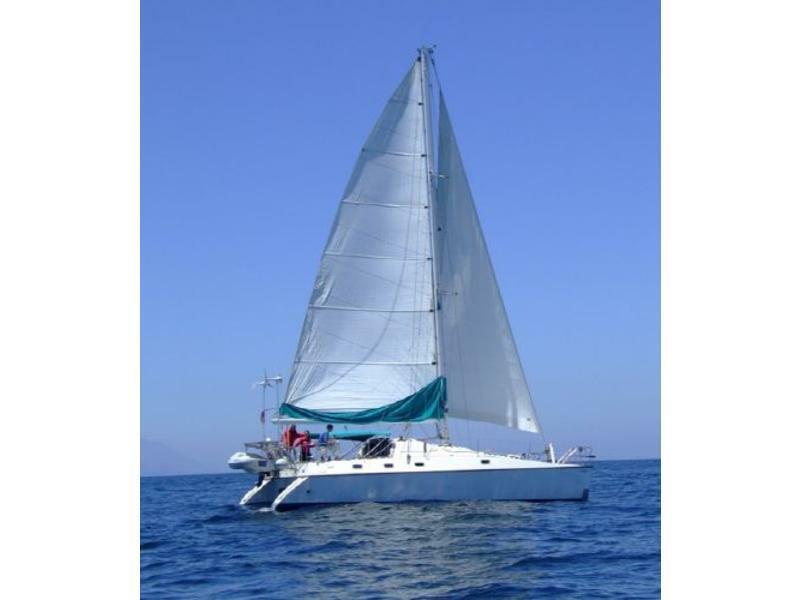 A canvas bimini shades the table and seating area while sunning spaces with cushions outboard port and starboard allow sun worshipperss aboard a place to lounge. 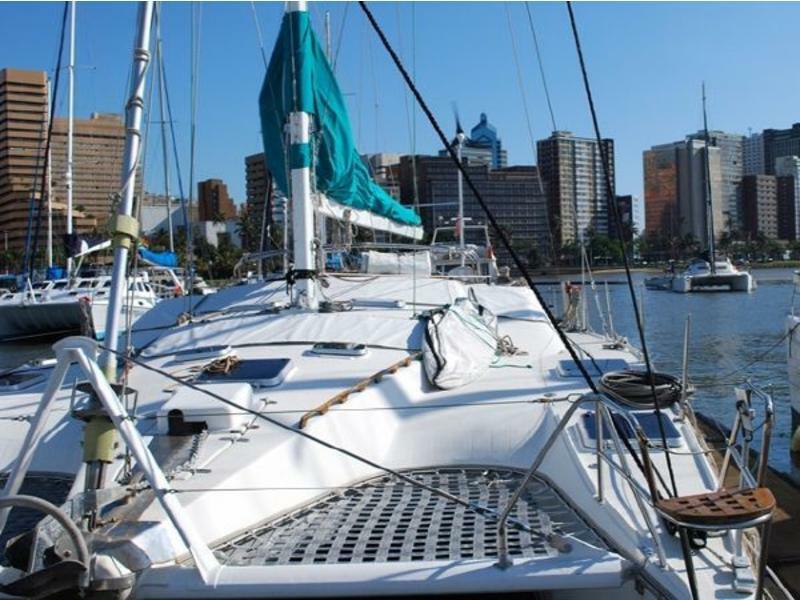 The helm is to port and aft, and the helmsman retains good visibility forward while remaining on the same level as guests and crew. Wide side decks make going forward safe and easy. 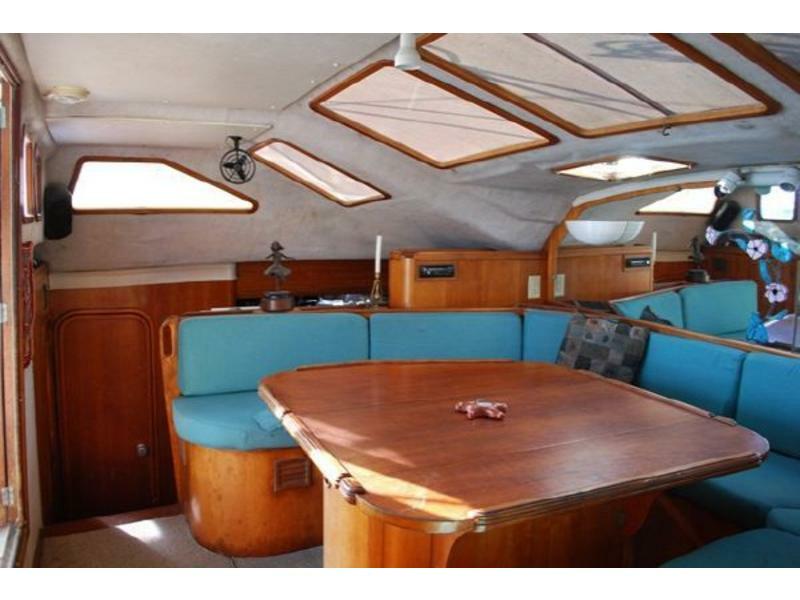 Through the double teak doors in the cockpit is the salon area featuring a 15 foot circular settee with dropleaf table and a roll out beverage cabinet. 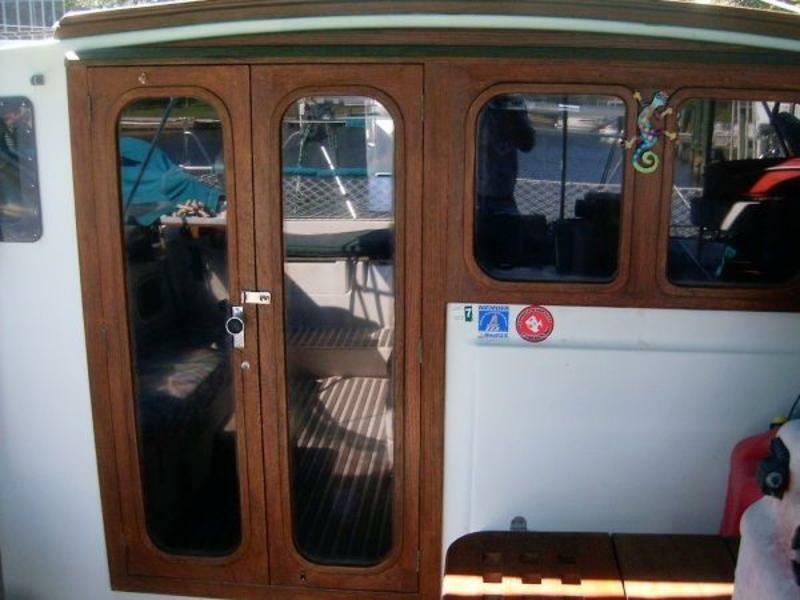 Quality teak joinerwork and and teak and holly floors add a luxurious feel everywhere on this boat. 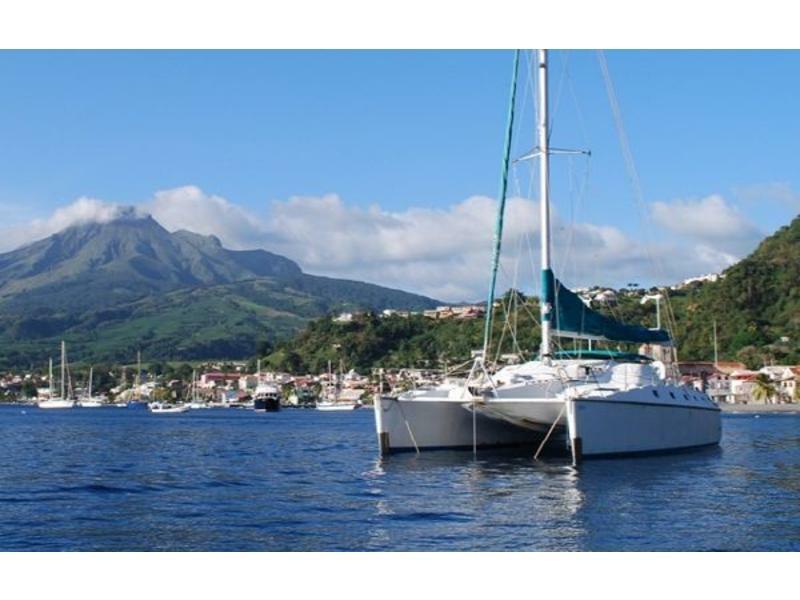 8 opening ports and 11 opening deck hatches provide excellent ventilation throughout the vessel. 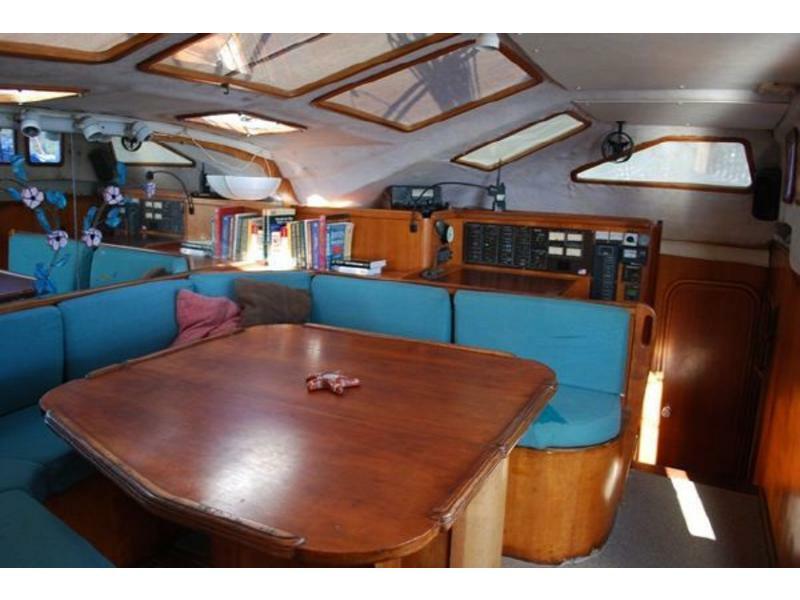 The Nav station is to starboard of the settee. 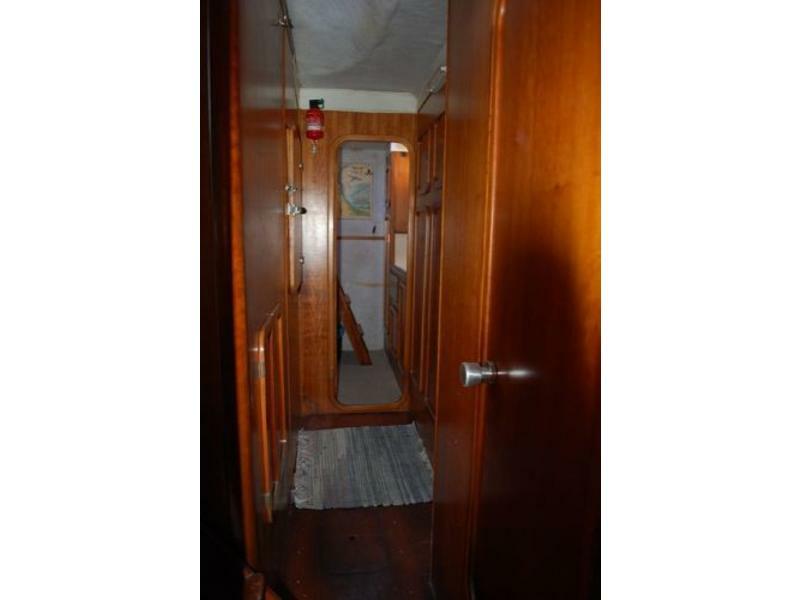 Companionways port and starboard in the aft part of the salon lead to the hull accomodations. 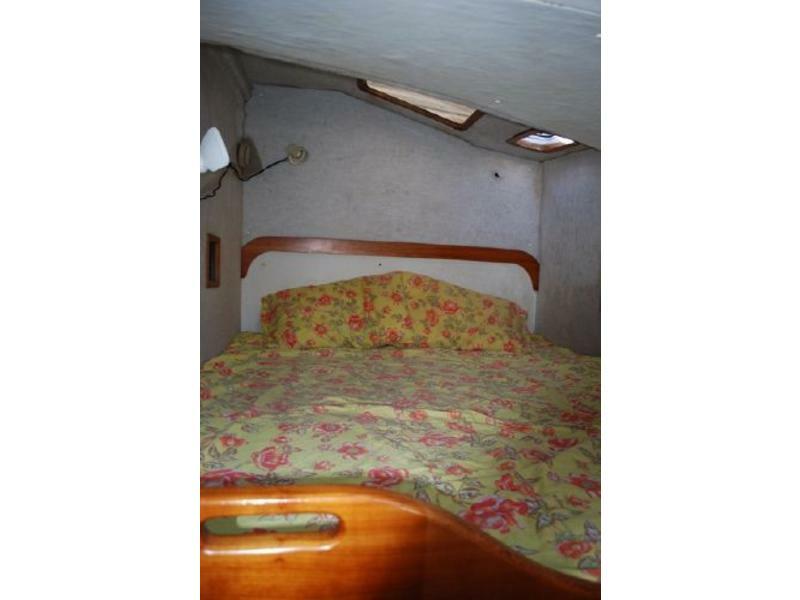 There are four equal double berth staterooms in the ends of the hulls. Each has its own vanity and sink, hanging locker and storage. 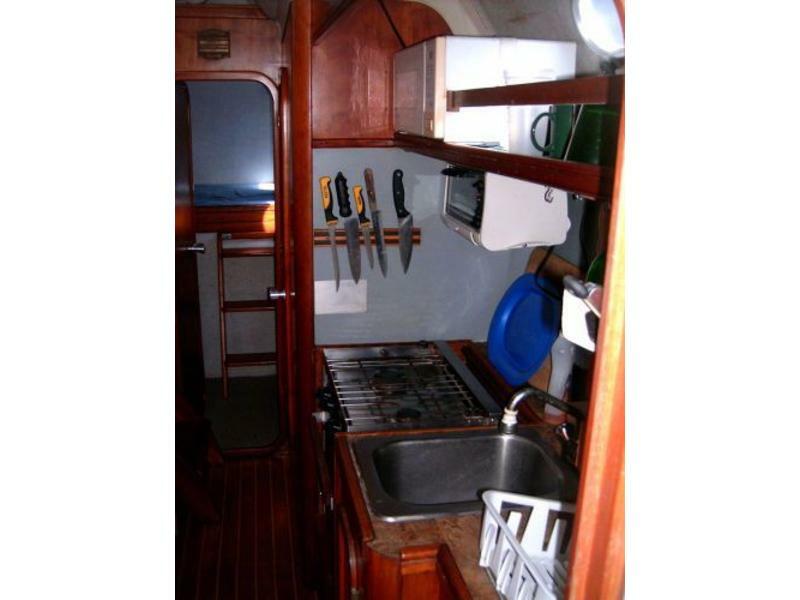 A head with standup shower is located outboard at the foot of the companionway steps in each hull. 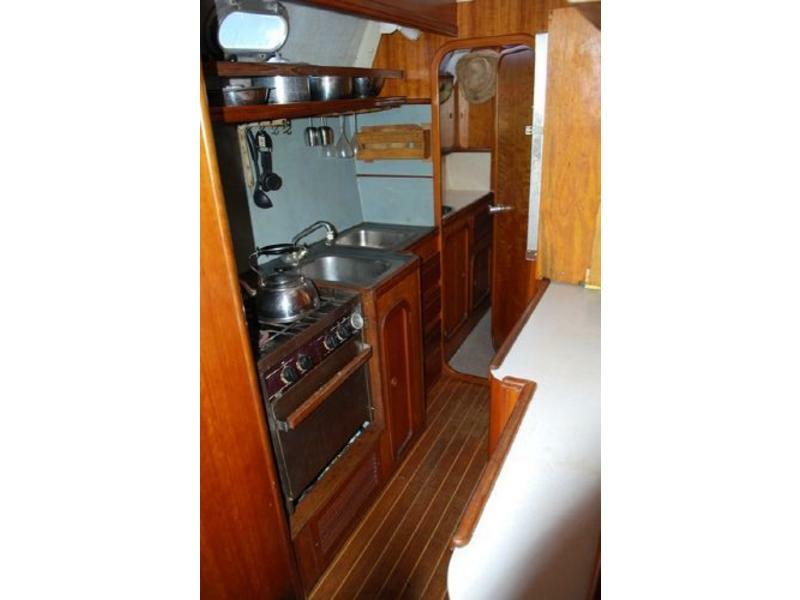 The galley is located in the port hull with a gimbaled LP range, 3 way refrigeration, double sink and ample counter and storage space. 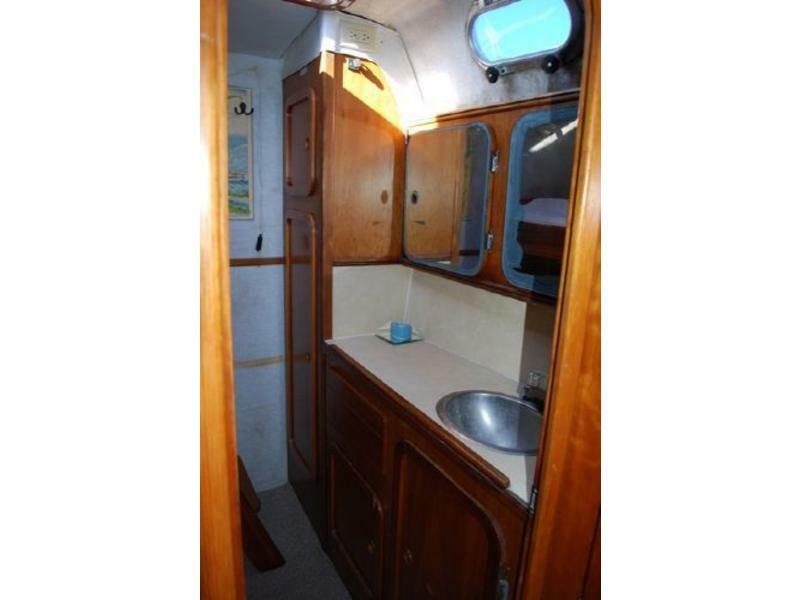 The starboard companionway features an extra fridge freezer unit and tons of storage filled with enough spares to start a marine store!